Many visitors flock to Maine for the great fishing and for good reason. Maine fishing is some of the finest in the country and is sure to give you the outdoor experience of a lifetime. Along with the thousands of miles of ocean coastline there are over 6,000 lakes and ponds in Maine, providing ample opportunity for you to cast a line and catch something. Here’s how to best enjoy Maine fishing! Maine fishing provides you with an opportunity to catch eastern brook trout, one of the last places to still catch the fish. 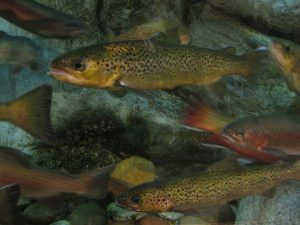 Over 90% of the United States’ pond brook trout are in Maine. Maine fishing also provides plenty of landlocked salmon which bring fishermen from all over the Northeast to the state. There are plenty of bass to fish in Maine as well, becoming one of the leading states for bass fishing. Bring the family along to go fishing, as Maine fishing is absolutely family-friendly. There are 47 waters in 13 counties that provide exclusive fishing spots for children ages 15 and under. If you’re looking to head out on the ocean, Maine has great fishing off the shore. Shark fishing is popular and provides an unusual experience for most anglers. There are companies that offer shark fishing trips using conventional and fly tackle, giving you one of the most unique fishing experiences! Fly fishing is very famous in Maine with many anglers being expert fly fishers. Many of the famous fly patterns were established in Maine and have stood the test of time with many fishermen. At the famous outfitter, L.L. Bean in Freeport, there are fly fishing instruction classes for all skill levels. There are classes and private instruction so you can learn all the necessary skills to go out fly fishing. With so many great fishing spots in Maine, there is no excuse to not head out on the water and try your hand. Try to catch a shark or other sea life in the ocean on an offshore fishing trip or head inland to one of the many lakes and rivers. Fishing has long been a Maine tradition and is great reason to visit. There are many great fishing spots in Maine and when you are looking at great things in the area, how about a stay at Dockside Guest Quarters? Not only do the accommodations offer timeless style combined with modern comforts, but when you stay you also get breakfast from our bountiful buffet each morning, ensuring that your days will start off on the right note. Our Dockside Restaurant is perfect for a great meal you can have when you are not trying one of the great cooking classes at the Stonewall Kitchen. For an all-around good time in coastal Maine, stay at Dockside Guest Quarters. We can’t wait to see you soon!